She of course was not concerned because she knew her little treasure was going to be a vampire for Halloween. Yes, yes, that makes a difference in context. 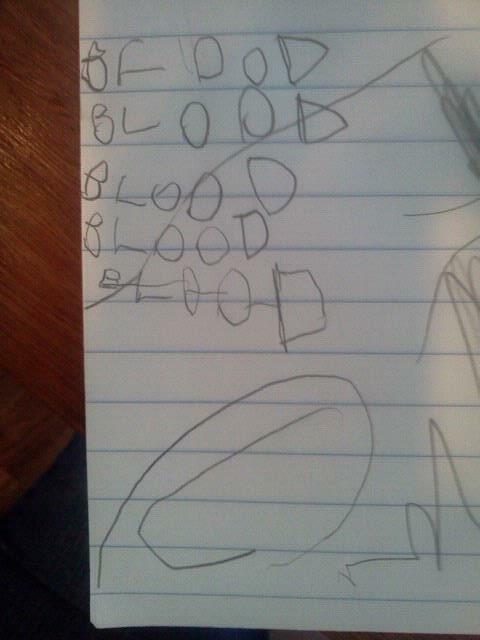 Now if her kiddo made that drawing on a random Tuesday in March, it would be a different story, no? I have a memorable assessment from last Halloween time to illustrate the point…I was walking this kiddo to the testing room, when I spotted a huge spider web and a spider was chilling in the middle. I am not a huge spider fan, but I do anthropomorphize every spider into being that nice spider from Charlotte’s Web, so I said, “Oh look! That spider made us a web for Halloween!” The child turned to look at the spider’s web and then started spitting on the spider, yelling “Die! Die! Die you mother*#(%#@!” Whoa. I did not see that coming. Later, when I asked him to draw a picture of a person, he drew a vampire with a machine gun, blasting all the spiders in the world. Soooooo, you’re not a fan of spiders, eh? Kids’ drawings are awesome. They are one of my favorite parts of the assessment process. Aside from the comorbidity of creepy drawings and Halloween, drawings can reveal a lot about our students. I especially love the Kinetic School Drawing, which is basically a way to see how the kid feels about school. You just ask them to draw a picture of themselves at school at any time of day and see what they come up with. I wish I had kept this drawing of this 10th grade student I was assessing for ADHD (who later cornered me on the streets of SF with his pack of friends yelling, “Hey, that’s the lady that put me in special ed! Thanks lady, special ed is way easier!”). His drawing was a cartoon-style sequence of him getting in trouble (“Here’s where my pencil accidently flies out the window, then here is me getting kicked out, and here’s me going down the stairs to the dean’s office, and here’s the dean saying to get a pass, and here’s me going back up the stairs, and here’s the teacher saying I can’t go back to class without a pass, and here’s me going back to the dean’s office…”). Another kiddo who I was assessing for Asperger’s syndrome drew the most literal interpretation of the drawing I’ve ever seen. He started drawing every facet of the school building, including the irrigation system out front. When I asked him to draw a picture of himself in the drawing, as if I had a camera and took a picture of him at school, he drew a picture of me jumping out of a locker with a camera, taking his picture. HA! I love it. My absolute favorite drawing was actually of me (not a Me-Monster story, I promise). The kid was 6 years old and in a school for students with emotional disturbance. The kid hated testing so much, it was torture to get anything done. After daaaaaays of trying to get something out of the guy, I finally asked him to draw a picture and tell me a story. He drew this monsterously fat and ugly person and said, “This is Dr. Fat, no I mean, Dr. B. She was a horrible fat person who made kids do stuff. She has a timer and her pencils and a monster ate her.” Soooooo, how do you feel about testing, little buddy? *My friends and I also played a related game around Halloween when we were in grad school at Berkeley called “Normal dress or Halloween costume?” So, when a cloaked man entered the “Games of Berkeley” store, was he normally dressed for his fantasy board game club, or was it a Halloween costume? Is that a hippie costume or an actual hippie? Comments on My Favorite Halloween Game. I totally forgot about "Normal Dress or Halloween Costume?" I can't say the other game we used to play while driving as it is not PC. Happy Halloween Dr. B and beautiful baby B! By posting this student's work, you have broken confidentiality. Even if the name is not visible to the public. This was inappropriate. @anonymous: Thank you for your concern. This was not a client, but a friend's child. The parent (my friend) gave me permission to use it. It is true that you cannot post children's artwork without consent, thanks for bringing this up.